Many wearers don't know how to repair if tears or holes appear on lace wig,the cap construction is human hair hand tied mesh base area around 4 inches at front of wig,the rest is hair wefts combined with the front lace top,so a piece of lace is sewn in place that can part any where,such lace front wig creating a natural hairline like full lace wig.it is more quicker to repair your damaged and ripped lace front wig.Over time, this lace can tear loose from the joint of the wefts,causing the front to separate from the rest of the wig. 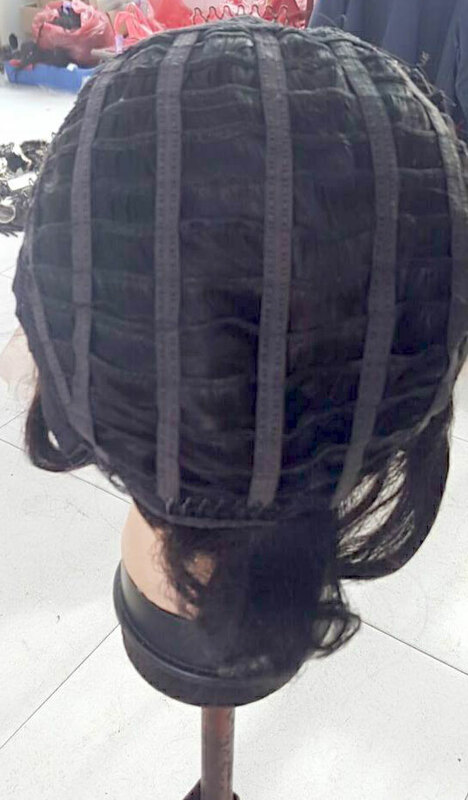 When this happens,it is important to repair a thin or damaged wig before to preserve the wig.fixing human hair lace front wig is more quicker than full lace wig. 1.Rurn lace front wig inside out,pin in on a mannequin head.Take a small needle and some nylon thread to repair the tare. If you've lost a lot of netting you will have to make a patch to fill in the area.For this you can use, a similar net fabric that you can purchase from the fabric store. You can also cut a small piece of your neutral or flesh color pantyhose and sew it in just to fill in what you have lost now using tiny stitches sew it in place to replace what was bald spot and lock stitch it in with a few small knots and cut. 2.Use a comb to brush a part in the lace front wig, following the separation between the lace and weft hair. Clip the hair on both sides,to keep it out of your way. 3.Now start filling in the thin areas in the front of the lace front wig:Fex bald spot hole on front lace base,Using A Ventilation Needle and Holder, Use The Bulk Hair of similar color follow professional instructions below to start adding the hair one to no more than three strands of hair at a time. Making a Wig is just like making a Rug.after doing for a whille,you'll managed to more and more faster! 4.Thread a curved needle with monofilament,a clear plastic thread can be found in most fabric stores.Carefully sew the lace back onto the weave hair side with a simple overhand stitch, creating a series of small loops that joins the two materials back together. 5.Tie off the monofilament after you complete to joint the both side together. 6.Sew a second row of overhand stitches on top of the first for added strength. 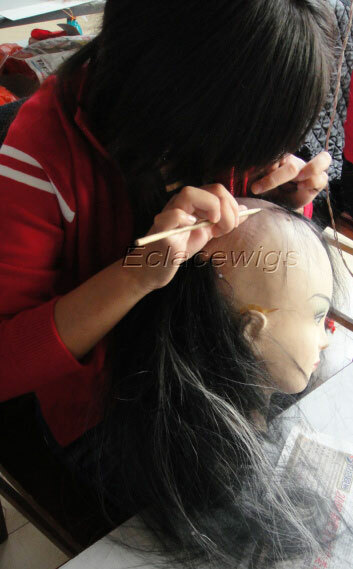 7.Remove the clips and brush the hair back in place after compelte the repair of lace front wig. You'll be feeling so happy when you complete the procedures and get a new lace front wig.